Trigeminal neuralgia (TN) is a trigeminal nerve disorder which causes an agonizing facial pain in the affected patients.TN is also called as "suicide disease"  and this terminology explains the extent of pain in patients. The cause for TN is the focal demyelination of trigeminal nerve root by vascular compression. Generally, TN occurs unilaterally; however, occasionally may be bilateral. There are three main treatment modalities for TN: medical treatments through drugs, surgical treatment and radiosurgery treatment. ,[,6], Micro-vascular decompression (MVD) is a well-known surgical treatment for TN. , Radiosurgery for TN has been performed either as a frame based or as a frameless radiosurgery. Frame based is an invasive method while frameless is a noninvasive method. Leksell Gamma Knife (Elekta Instruments, Norcross, GA) , radiosurgery is a frame based procedure, while CyberKnife (Accuray, Sunnyvale, USA) , is an image guided frameless procedures. In the BrainLAB Novalis (BrainLAB A.G., Heimstetten, Germany) , radiosurgery system, both the frame based and frameless procedures are being performed. The radiation dose required to treat TN is very large when compared with all other radiosurgical procedures performed in the cranium. The dose in Gamma Knife is often prescribed to a 50% isodose, and the prescription dose is between 35 Gy to 40 Gy. A maximum of 70 Gy to 90 Gy is delivered to the trigeminal nerve in Gamma Knife. Similarly in CyberKnife, the dose is prescribed to 75% to 85% isodose and the prescription dose is 60 Gy. This very high dose prescription to the very tiny trigeminal nerve necessitates very precise targeting. Especially, the organs at risk (OAR) doses should be restricted to their tolerance limit. Brain stem is the critically closer OAR to the trigeminal nerve in the treatment of TN. Treatment planning plays a crucial role in restricting the dose to the brain stem. In CyberKnife, the treatment planning is performed in a dedicated planning system called Multiplan (Accuray, Sunnyvale, USA). There are many numbers of studies on the clinical outcomes of the radiosurgical treatment of TN. However, there are only a limited number of studies available on the dose distribution in and around the trigeminal nerve in the radiosurgery of TN, especially in the cyberknife radiosurgery. The present study aims to analyze the dose distribution in the trigeminal nerve and in the brain stem in cases treated with CyberKnife stereotactic radiosurgery system. Seven TN cases treated between November 2010 and January 2012 were taken retrospectively for this study. Out of these seven cases, four were cases of TN in the left side, and three were of TN in the right side. Four of them were males and three were female patients. The median age and the mean age were 61 and 57.2 years, respectively. Visualization of the trigeminal nerve is an important task in TN treatment. The Computed Tomography (CT) images of the cranium were acquired in 1 mm slice thickness. These CT images were fused accurately with a special T2 weighted Drive sequence magnetic resonance (MR) images [Figure 1]. With the help of these T2 Drive MR images, the trigeminal nerve and the OARs were drawn on the fused CT images. The target was drawn in such a way that the target segment of the trigeminal nerve starts from 2 to 3 mm away from the root entry zone (REZ). The length of the target segment in the trigeminal nerve was delineated for about 6 mm in 3 CT slices of 1 mm thickness. CyberKnife plans are associated with site specific paths which give the information about the beam orientation. A dedicated trigeminal path is also provided for the treatment of TN. The smallest 5 mm fixed type collimator was taken for treating TN. The goal dose to the trigeminal nerve target was set as 60 Gy. The dose gradient around the target was set as a goal in the treatment planning. The 60 Gy dose was limited within a shell of 0.5 mm around the target. Similarly 55 Gy to 2 mm shell, 48 Gy to 5 mm shell and 28 Gy was set to 10 mm shell. The dose constraint for the brainstem was kept as 40 Gy. The maximum dose in the target was taken as the normalizing dose. The plans were made and evaluated. The target volume doses D 98%, D 90% , D 50% , D 30% , and D 10% were evaluated from the dose volume histogram (DVH). The amount of trigeminal nerve target volume receiving 100% of the prescribed dose, V 100% , was also evaluated in percentage. The dose conformity index and homogeneity index of the TN target were also analyzed. The formulae used to calculate the conformity index and the homogeneity index are given as follows. Where D max is the maximum dose in the nerve target and D RI is the reference / prescription isodose. Brainstem doses were evaluated in terms of D 1% , D 2%, D 5% and D 10%. This low percentage volume doses are representing the higher doses in the brain stem. Along with this, the maximum point doses and the mean doses in the target as well as in the brainstem were also estimated for analysis. The p-values were calculated using two tailed Student's T-test and tabulated in appropriate tables. The mean volume of the trigeminal nerve target was 37.9 ± 2.5 mm 3 . The minimum volume was 35.4 mm 3 and the maximum volume was 42.3 mm 3 . The mean volume of the brainstem was 22 ± 4.7 cm 3 . 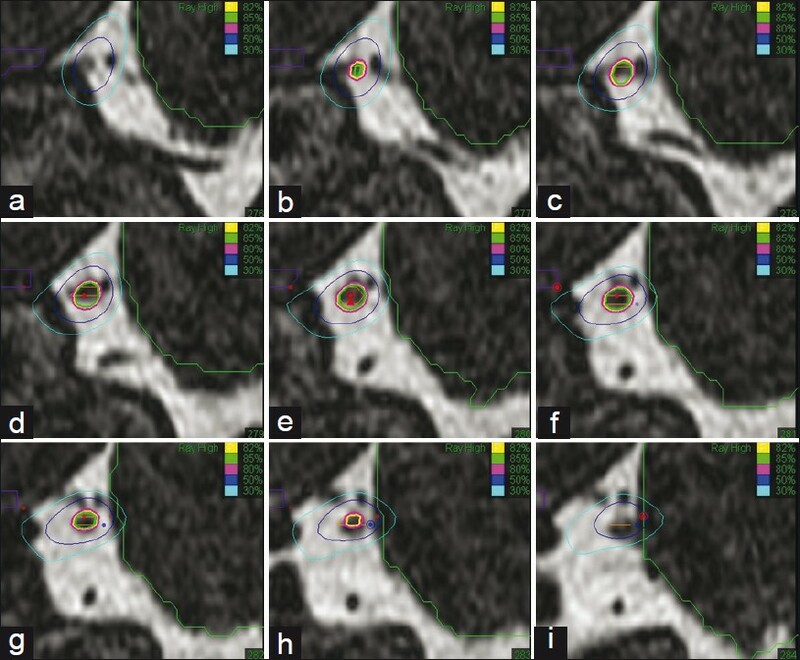 The dose distributions in the axial, sagittal and coronal sections in the MR images are shown in [Figure 2], [Figure 3] and [Figure 4] respectively. 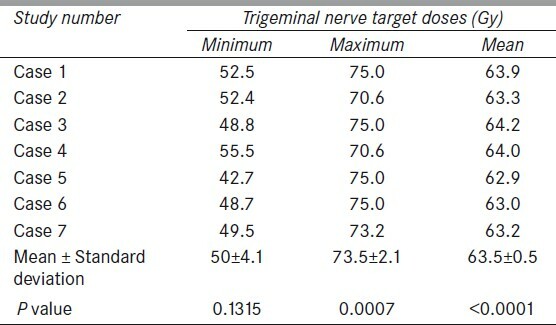 The D 98% , D 90%, D 50%, D 30% and D 10% values of the trigeminal nerve target are shown in [Table 1]. D 98% is a measure of the minimum dose within the trigeminal nerve target. The mean value of D 98% was 51.8 ± 3.6 Gy. The maximum and the minimum values of D 98% were 56.5 Gy and 45.0 Gy, respectively. Similarly, D 10% is the measure of maximum dose within the trigeminal target. D 10% was ranging between 67.1 Gy and 74.3 Gy. The mean value was 70.8 ± 2.4 Gy. The percentage volume of the trigeminal nerve target receiving 100% of the prescribed dose, V 100% , was 75.8 ± 4.6%. The mean values of CI and the HI were 2.19 ± 0.32 and 1.2 ± 0.03, respectively. The mean value of the prescribing isodose was 81.7 ± 2.4 %. The conformity and homogeneity indices, the prescribing isodose and V 100% are shown in [Table 2]. Minimum, maximum point doses and the mean doses in the target are shown in [Table 3]. The mean maximum dose was 73.5± 2.1 Gy, and this maximum point dose was varying between 70.6 Gy and 75 Gy. Similarly the mean value of the minimum point dose was 50.0 ± 4.1 Gy and range of the minimum point dose in the trigeminal nerve target was from 42.7 Gy to 55.5 Gy. The D 1% , D 2%, D 5% and D 10% values of the OAR brainstem are shown in [Table 4]. The mean brainstem dose and the maximum point dose in the brainstem are also shown in [Table 4]. The volume doses D 1% , and D 2%, are representing the maximum doses in the brainstem, while D 5% and D 10% are representing the degree of dose fall off in the brainstem. The mean values of D 1% , D 2%, D 5% and D 10% were 10.5 ± 2.1 Gy, 7.9 ± 1.8 Gy, 5.1 ± 1.7 Gy and 3.3 ± 1.3 Gy respectively. The maximum point dose was varying between 29.4 Gy and 40.0 Gy and the mean value was 35.6 ± 3.8 Gy. The mean prescribing isodose line in the present study is 81.7% and the mean coverage is 75.8%. This shows that about 24% of the tiny trigeminal target is receiving dose lesser than 60 Gy. But the mean minimum dose of the target is 50.01 ± 4.06 Gy. Hence the trigeminal nerve target is in the range of ~50 Gy to ~73.5 Gy. However the mean conformity index is 2.19. This shows that there is an equal volume of normal tissue surrounding the target equal to the volume of the target is receiving the prescribing dose. 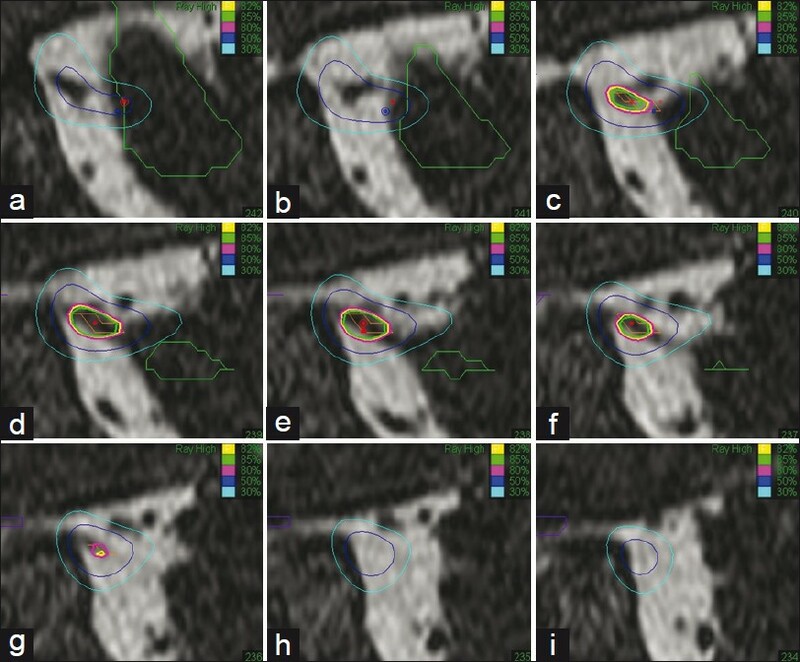 This is mainly because of the size of the target and this TN target is possibly the smallest target among all the targets treated in radiosurgery. Also the minimum size of the collimator available in CyberKnife is 5 mm. The width of the TN nerve target in any of CT slice containing the target is about 2 mm only. These are the possible reason for the higher value of conformity index in radiosurgery treatment of TN. The mean value of the homogeneity index is 1.23 which shows that the dose variation within the target is about 23% and the mean value of the mean target dose is 63.5 Gy. The target dose coverage usually lowered because of the dose restriction to the brain stem. The mean value of the D 1% in the brainstem is 10Gy while the mean maximum point dose in brain stem is 35.6 Gy. The mean value of 1% volume of brainstem is 0.22 ± 0.05 cm 3 . This shows that the 50% of the prescribed 60 Gy dose (30 Gy) is falling well within this 0.22 cm 3 volume of the brain stem which is closer to the trigeminal nerve REZ. The brainstem dose gradient analysis by D 2% , D 5% and D 10% are showing a better dose fall off of dose within the brainstem. The target segment of the trigeminal nerve should be irradiated with an adequate dose to reduce the pain due to TN. The present study shows that the point dose maximum in CyberKnife radiosurgery of TN is about 75 Gy. The study also shows that the dose distribution in the tiny target is not limited within the target. The minimal collimator of 5 mm could be the possible reason for this. Though there is a spillage of dose outside the target, it is not towards the critical OAR brainstem. According to the present study, the maximum brainstem point dose is less than 50% of the maximum point dose in the target. Though the results of the present study are showing superior sparing of brain stem and reasonable of target coverage, it is necessary to correlate the dose distribution with the clinical outcomes through follow ups. The effectiveness of the treatment plan exists in the proper execution with greatest accuracy, as the CyberKnife radiosurgery is executed with a noninvasive immobilization. 1. Adams H, Pendleton C, Latimer K, Cohen-Gadol AA, Carson BS, Quinones-Hinojosa A. Harvey Cushing's case series of trigeminal neuralgia at the Johns Hopkins Hospital: A surgeon's quest to advance the treatment of the 'suicide disease'. Acta Neurochir (Wien) 2011; 153:1043-50. 2. Oh IH, Choi SK, Park BJ, Kim TS, Rhee BA, Lim YJ. The treatment outcome of elderly patients with idiopathic trigeminal neuralgia: Micro-vascular decompression versus gamma knife radiosurgery. J Korean Neurosurg Soc 2008; 44:199-204. 3. Brisman R. Bilateral trigeminal neuralgia. J Neurosurg 1987; 67:44-8. 4. Mendoza N, Illingworth RD. Trigeminal neuralgia treated by microvascular decompression: A long-term follow-up study. Br J Neurosurg 1995; 9:13-9. 5. Brisman R. Surgical treatment of trigeminal neuralgia. Semin Neurol 1997; 17:367-72. 6. Zakrzewska JM, Patsalos PN. Long-term cohort study comparing medical (oxcarbazepine) and surgical management of intractable trigeminal neuralgia. Pain 2002; 95:259-66. 7. Obermann M. Treatment options in trigeminal neuralgia. Ther Adv Neurol Disord 2010; 3:107-15. 8. Chakravarthi PS, Ghanta R, Kattimani V. Microvascular decompression treatment for trigeminal neuralgia. J Craniofac Surg 2011; 22:894-8. 9. Sindou M, Leston J, Decullier E, Chapuis F. Microvascular decompression for primary trigeminal neuralgia: Long-term effectiveness and prognostic factors in a series of 362 consecutive patients with clear-cut neurovascular conflicts who underwent pure decompression. J Neurosurg 2007; 107:1144-53. 10. McNatt SA, Yu C, Giannotta SL, Zee CS, Apuzzo ML, Petrovich Z. Gamma Knife radiosurgery for trigeminal neuralgia. Neurosurgery 2005; 56:1295-301. 11. Kondziolka D, Zorro O, Lobato-Polo J, Kano H, Flannery TJ, Flickinger JC, et al. Gamma Knife stereotactic radiosurgery for idiopathic trigeminal neuralgia. J Neurosurg 2010; 112:758-65. 12. Tang CT, Chang SD, Tseng KY, Liu MY, Ju DT. CyberKnife stereotactic radiosurgical rhizotomy for refractory trigeminal neuralgia. J Clin Neurosci 2011; 18:1449-53. 14. Zahra H, Teh BS, Paulino AC, Yoshor D, Trask T, Baskin D, et al. Stereotactic radiosurgery for trigeminal neuralgia utilizing the BrainLAB Novalis system. Technol Cancer Res Treat 2009; 8:407-12. 15. 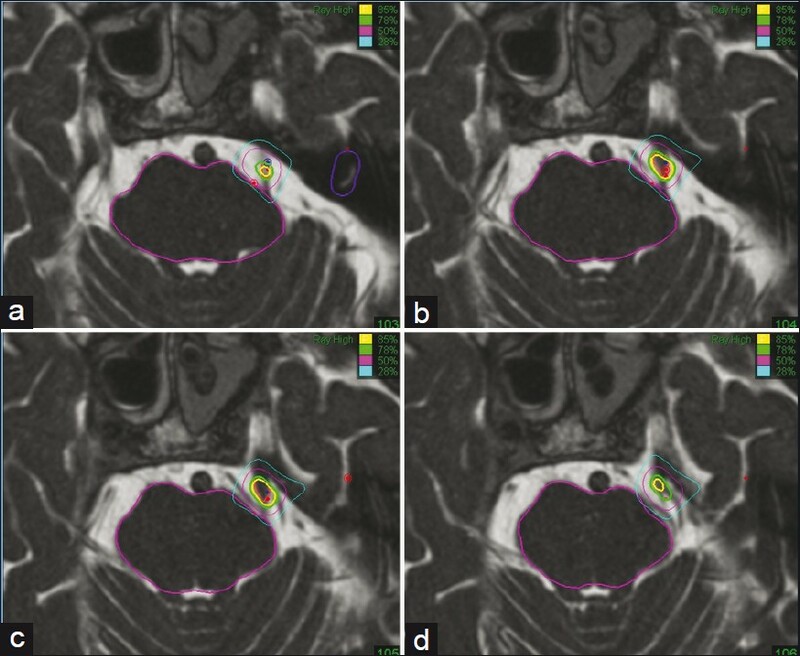 Chen JC, Rahimian J, Rahimian R, Arellano A, Miller MJ, Girvigian MR. Frameless image-guided radiosurgery for initial treatment of typical trigeminal neuralgia. World Neurosurg 2010; 74:538-43. 16. Rogers CL, Shetter AG, Fiedler JA, Smith KA, Han PP, Speiser BL. Gamma Knife radiosurgery for trigeminal neuralgia: The initial experience of The Barrow Neurological Institute. Int J Radiat Oncol Biol Phys 2000; 47:1013-9. 17. Henson CF, Goldman HW, Rosenwasser RH, Downes MB, Bednarz G, Pequignot EC, et al. Glycerol rhizotomy versus Gamma Knife radiosurgery for the treatment of trigeminal neuralgia: An analysis of patients treated at one institution. Int J Radiat Oncol Biol Phys 2005; 63:82-90. 18. Paddick I. A simple scoring ratio to index the conformity of radiosurgical treatment plans. Technical note. J Neurosurg 2000; 93 Suppl 3:219-22. 19. Nakamura JL, Verhey LJ, Smith V, Petti PL, Lamborn KR, Larson DA, et al. Dose conformity of Gamma Knife radiosurgery and risk factors for complications. Int J Radiat Oncol Biol Phys 2001; 51:1313-9. 20. Shaw E, Kline R, Gillin M, Souhami L, Hirschfeld A, Dinapoli R, et al. Radiation Therapy Oncology Group: Radiosurgery quality assurance guidelines. Int J Radiat Oncol Biol Phys 1993; 27:1231-9. 21. Sheehan J, Pan HC, Stroila M, Steiner L. Gamma Knife surgery for trigeminal neuralgia: outcomes and prognostic factors. J Neurosurg2005; 102:434-41. 22. Pollock BE, Phuong LK, Foote RL, Stafford SL, Gorman DA. High-dose trigeminal neuralgia radiosurgery associated with increased risk of trigeminal nerve dysfunction. Neurosurgery 2001; 49:58-62. 23. Adler JR Jr, Bower R, Gupta G, Lim M, Efron A, Gibbs IC, et al. Nonisocentric radiosurgical rhizotomy for trigeminal neuralgia. Neurosurgery 2009; 64:A84-90. 24. Villavicencio AT, Lim M, Burneikiene S, Romanelli P, Adler JR, McNeely L, et al. 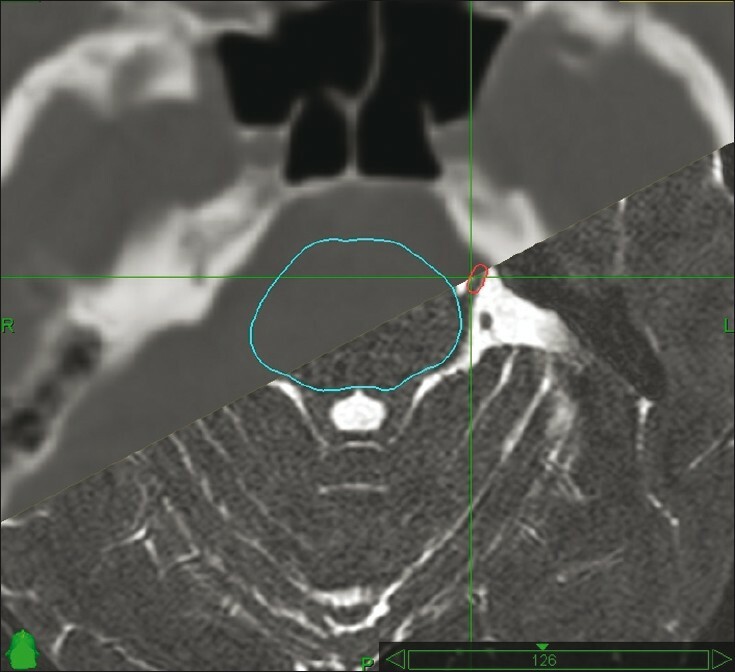 CyberKnife radiosurgery for trigeminal neuralgia treatment: A preliminary multicenter experience. Neurosurgery 2008; 62:647-55. 25. Fariselli L, Marras C, De Santis M, Marchetti M, Milanesi I, Broggi G. CyberKnife radiosurgery as a first treatment for idiopathic trigeminal neuralgia. Neurosurgery 2009; 64:A96-101.